Back for the fourth year: all summer long, get weekly recipe ideas by request for fresh produce from your CSA share or farmers' market. Simply leave a comment on Friday, telling me what produce you need help with, and I will provide a list of healthy, creative recipes the next Tuesday. It's back for 2014: the CSA Share Ninja Rescue, a weekly summertime feature in which you tell me on Fridays what veg you received (or will be receiving) in your CSA share box or found at the farmers' market that you don't know what to do with and I'll give you a whole bunch of recipe ideas on the following Tuesday. Yes: recipes by request, served directly to you from The Ninj. I took the initial baby steps toward becoming The Ninj many years ago when I signed up for my first CSA program. Each week I received gorgeous vegetables and greens that I could barely identify, let alone know how to prepare. I was lucky enough to be part of a CSA that provided a big recipe booklet, carefully indexed and organized to cover all the produce one could receive from the farm in an entire year. So I've turned myself into the virtual recipe booklet that you may or may not be getting as part of your local CSA share. 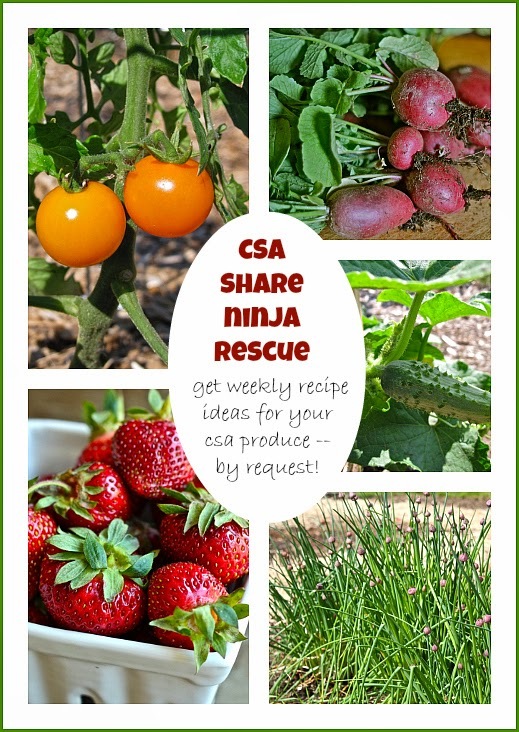 Check out one of the CSA Share Ninja Rescue posts from last year to see how it works. I base my choices on seasonality and popularity -- that is, if you comment that you happen to have some pumpkin in July, I'm likely not going to choose pumpkin as one of the highlighted items for that week. I try not to be judgy about defining "seasonality" -- I do bear in mind that while I'm on the East Coast of the United States, you may not be. You must leave a comment on the blog to be considered (sorry, Facebook or Pinterest comments won't make the cut). Since this is the fourth year that I have been doing the CSA Share Ninja Rescue, be sure to check the CSA Share Ideas page in the recipe index regularly for many, many more produce recipe ideas. So let's get started: whatcha got in your box this week? Leave a comment below. What a super cool idea Ninj! Love this!!!! How about grape leaves? We have a ton of young grape leaves right at the moment, and I'm wondering what's out there besides dolmas. You got it! Although this one will be a challenge for me, I think.